Down Syndrome Guild of Southeast Michigan - What is DS? What is Down Syndrome (DS)? Down syndrome is a genetic condition that causes delays in physical and intellectual development. It occurs in approximately one in every 800 live births. Individuals with Down syndrome have 47 chromosomes instead of the usual 46. It is the most frequently occurring chromosomal disorder. Down syndrome is not related to race, nationality, religion or socioeconomic status. The most important fact to know about individuals with Down syndrome is that they are more like others than they are different. Down syndrome is usually identified at birth or shortly thereafter. Initially the diagnosis is based on physical characteristics that are commonly seen in babies with Down syndrome. These may include low muscle tone, a single crease across the palm of the hand, a slightly flattened facial profile and an upward slant to the eyes. The diagnosis must be confirmed by a chromosome study (karyotype). 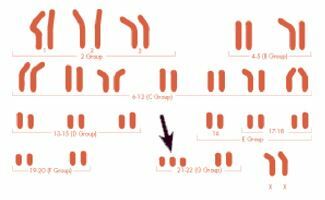 A karyotype provides a visual display of the chromosomes grouped by their size, number and shape. Chromosomes may be studied by examining blood or tissue cells. Down syndrome is usually caused by an error in cell division called nondisjunction. It is not known why this occurs. However, it is known that the error occurs at conception and is not related to anything the mother did during pregnancy. It has been known for some time that the incidence of Down syndrome increases with advancing maternal age. However, 80% of children with Down syndrome are born to women under 35 years of age. Some high school graduates with Down syndrome participate in post-secondary education. Many adults with Down syndrome are capable of working in the community, but some require a more structured environment. Many children with Down syndrome have health complications beyond the usual childhood illnesses. Approximately 40% of the children have congenital heart defects. It is very important that an echocardiogram be performed on all newborns with Down syndrome in order to identify any serious cardiac problems that might be present. Some of the heart conditions require surgery while others only require careful monitoring. Children with Down syndrome have a higher incidence of infection, respiratory, vision and hearing problems as well as thyroid and other medical conditions. However, with appropriate medical care most children and adults with Down syndrome can lead healthy lives. The average life expectancy of individuals with Down syndrome is 55 years, with many living into their sixties and seventies. The birth of a new baby is, and should be, a time for celebration and of joy. Your baby may not be as you have dreamed but please let us assure you that your baby is more like other babies than unlike. Ryan Teed recently gave the commencement address at his high school. Hope Banks graduated from college. Karen Gaffney swam Lake Tahoe a relay of the English Channel achieving her athletic dreams. Jillian and Ryan Mavriplis among many other men and women with Down syndrome, maintain strong marriages and other meaningful, life-long personal relationships. Two types of procedures are available to pregnant women: screening tests and diagnostic tests. The screening tests estimate the risk of the baby having Down syndrome. Diagnostic tests tell whether or not the baby actually has Down syndrome. At this time the most commonly used screening test is "The Triple Screen." This is a combination of three tests that measure quantities of various substances in the blood. These tests are usually done between 15 and 20 weeks of gestation. Sonograms (ultrasounds) are usually performed in conjunction with other screenings. These can show some physical traits that are helpful in calculating the risk of Down syndrome. Screening tests do not accurately confirm the diagnosis of Down syndrome. In fact, false positives and false negatives frequently occur. Amniocentesis is performed between 12 and 20 weeks gestation. Chorionic Villus Sampling (CVS) is conducted between 8 and 12 weeks. Percutaneous Umbilical Blood Sampling (PUBS) is performed after 20 weeks. Information provided by the National Association for Down syndrome (www.nads.org).